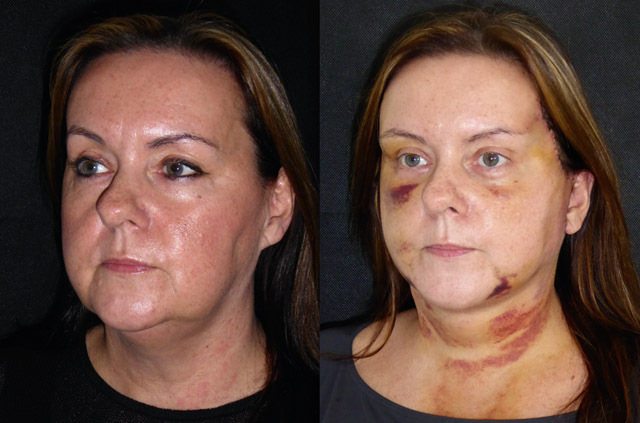 Karen is a theatre recovery nurse but has never had an operation herself. 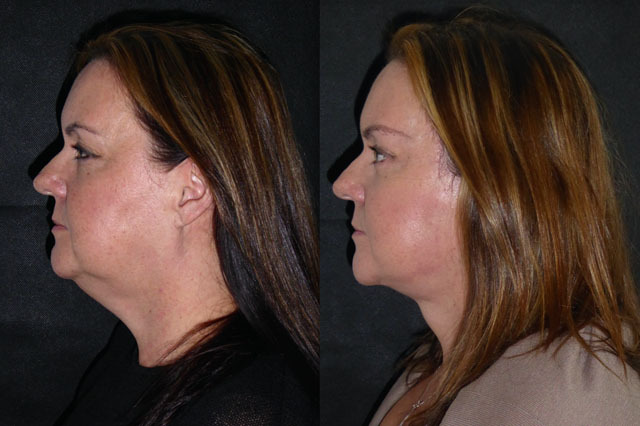 She consulted me about freshening her look and rediscovering her neck and jawlines. 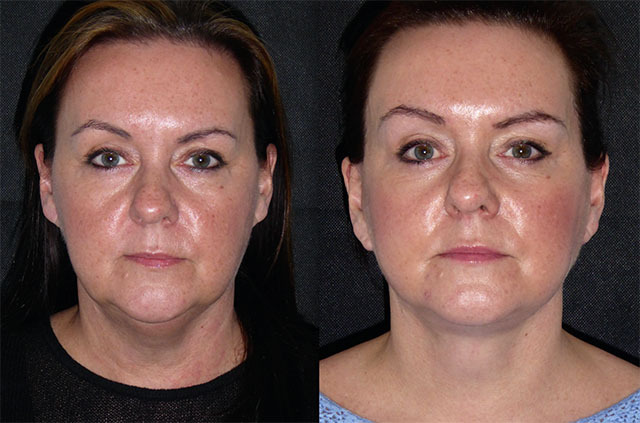 Karen has really lovely eyes and small neat features but these were masked by skin laxity, jowling and under chin fat accumulation. 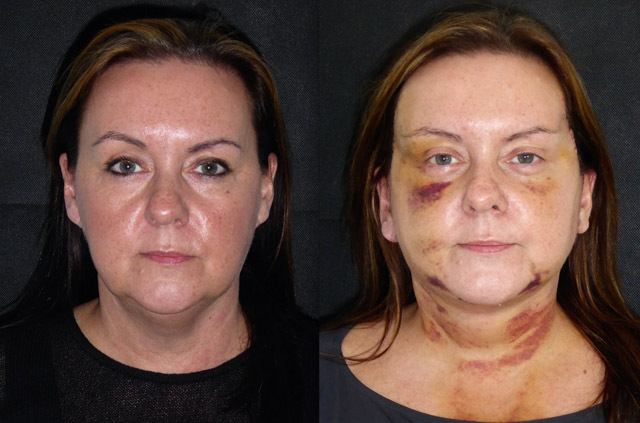 She underwent a face and neck lift, under chin and jawline liposuction, platysmaplasty, facial liposculpture, lateral temporal brow lift and transconjunctival lower blepharoplasty. Entirely under local anaesthetic and sedation. 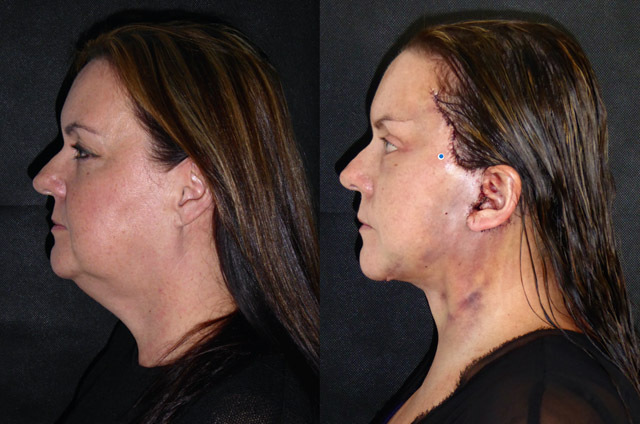 Here is her story. Karen soldiered through a marathon operation only a few hours ago. 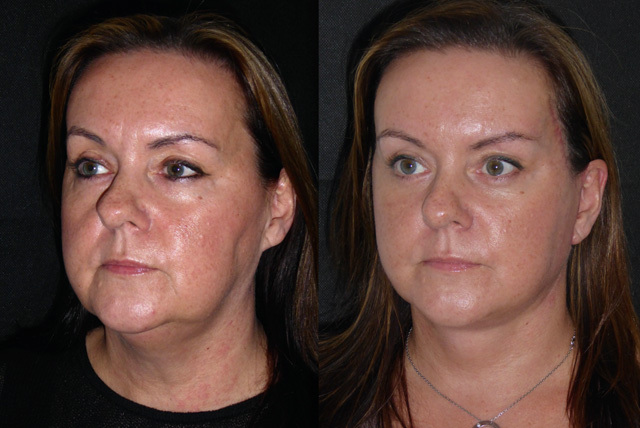 Her surgery was actually very easy but complicated by a menopausal hot flush which elevated her blood pressure during surgery. This caused some bleeding which means she will be more bruised than expected in a few days. Andy gave Karen iv medication to normalise her blood pressure and surgery was completely without a hitch in a little under 4 and half hours. 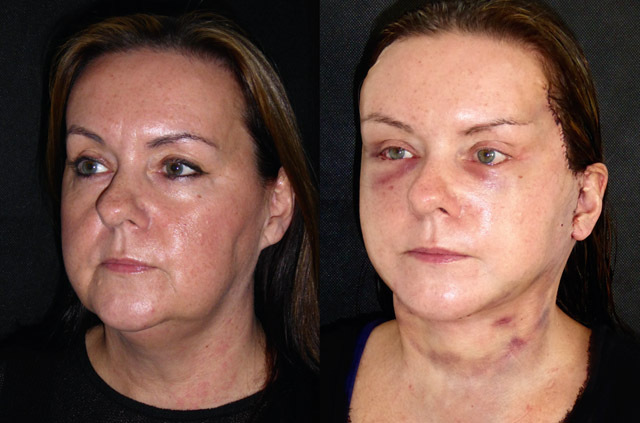 Already, despite the inevitable swelling, we can see Karen’s lovely natural face shape and neck line developing. A week on and Karen is back for removal of her stitches, she has healed super quickly from what was a lot of surgery. 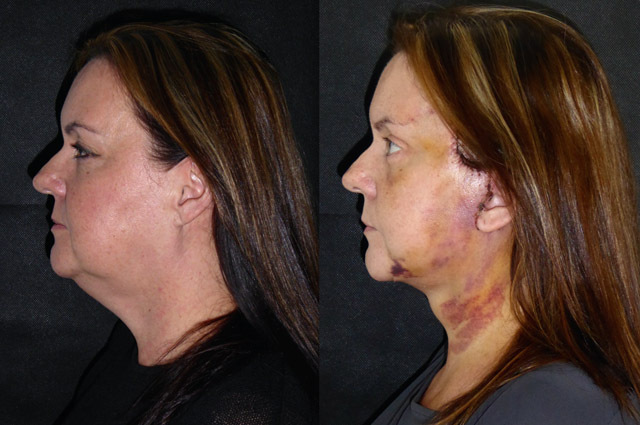 Her bruising is as expected for all her procedures and I suspect all bruising will be gone by 2 weeks. I have helped her along today by lasering her bruises. 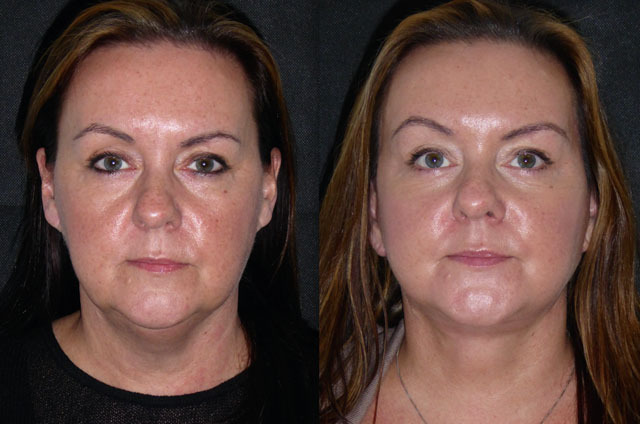 Her lower blepharoplasty and lateral brow lift has really softened her eyes, and the neck and facial work has defined a previously hidden jaw and neck line. It is hard for a colleague to be on the ‘other side’ but Karen has done brilliantly. I am really looking forward to seeing her again in a few weeks. Karen at a month looks wonderful. So fresh and rejuvenated. 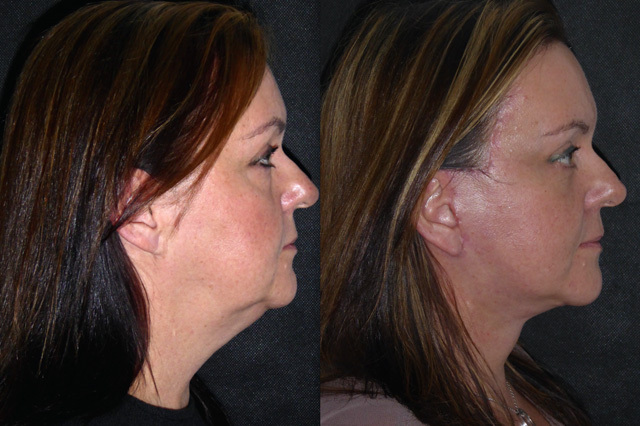 Her previously full neck has been recontoured and redefined, and her jowl volume now sits nicely in her mid face. 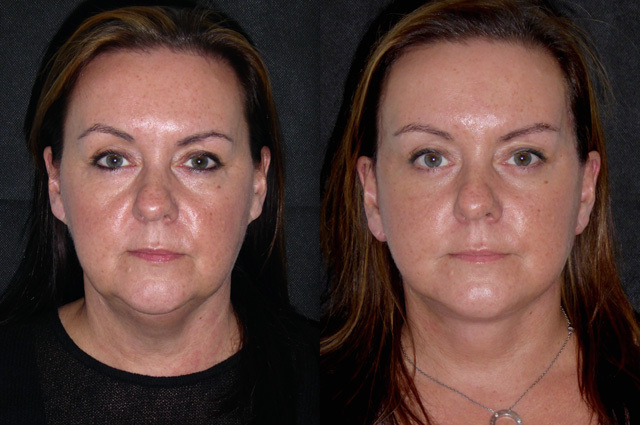 Her transconjunctival blepharoplasty has reduced her lower eyelid fullness and in conjunction with a browlift, her eyes look invigorated and youthful. 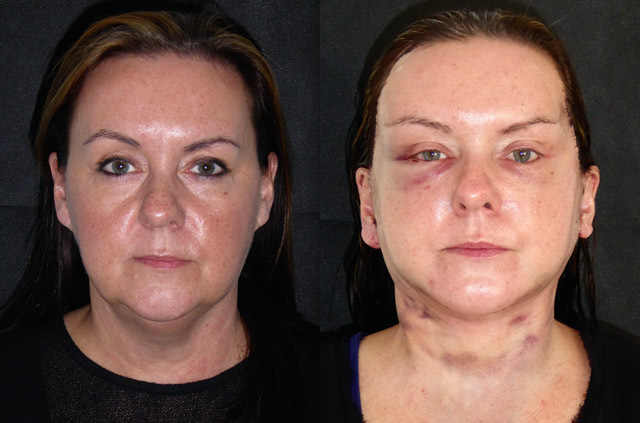 Karen’s scars will be their reddest now and will fade over the coming weeks and months. WOW! at 3 months out Karen looks amazing. Her skin is better and her eyes look lovely and alive. 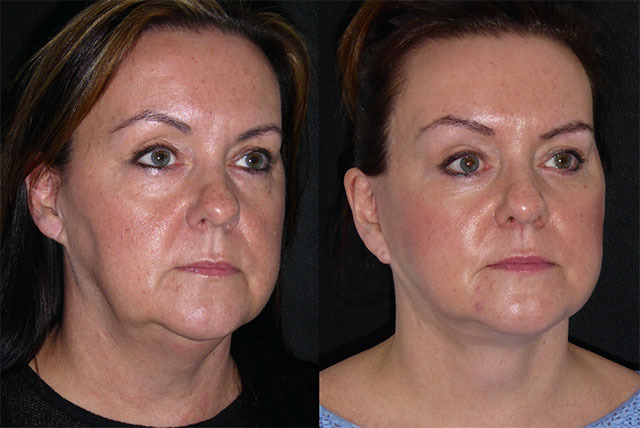 The jowls now occupy her middle facial third giving better balance and her neck line is defined. So happy for her. Operating on colleagues, Karen is a theatre nurse, is always a privilege and a challenge and I am delighted that Karen has had such a lovely result. Karen is back to see me at 8 months out and looking absolutely fantastic. 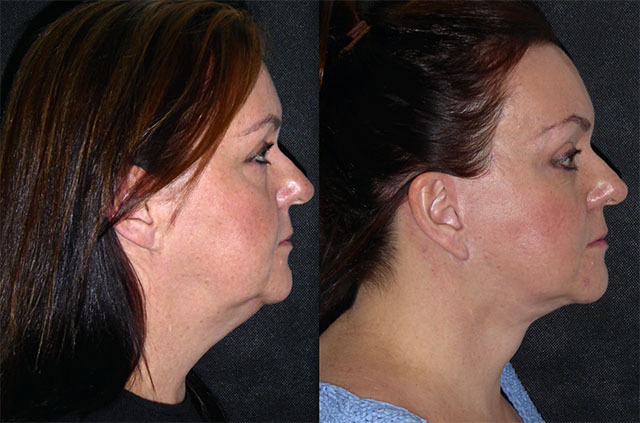 Her neck and jawlines remain nicely lifted and her face is softer and defined. Karen’s left earlobe scar is hypertrophic (thickened) and I have started her on a course of steroid injections today to soften this, hopefully this will improve the scar. 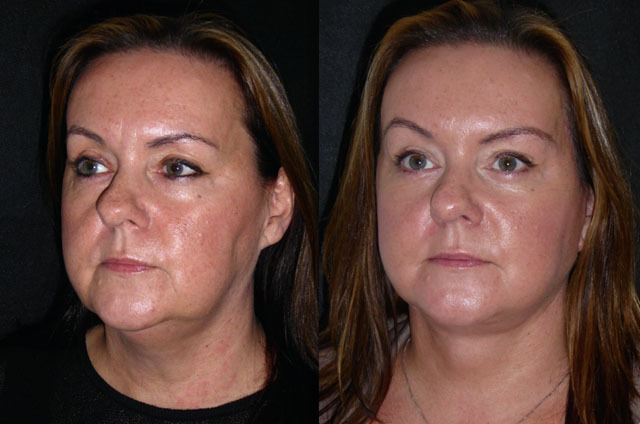 Karen has natural pixie ears (when the ear lobe connects directly to the face without a rounded hanging lobe) but the thickened scarring has accentuated this. Lets see how the injections go over the next few weeks and if the scar and earlobe haven’t significantly improved I will revise this small part for her.